Just as good as Chinese take out. The sauce is slightly sweet with a hint of spiciness. I choose to serve mine with some veggie egg rolls, brown rice and fresh fruit. 1. Cook chick'n according to directions on packet. Once cooked, slice each cutlet into 6 proportional pieces. Set aside. 2. 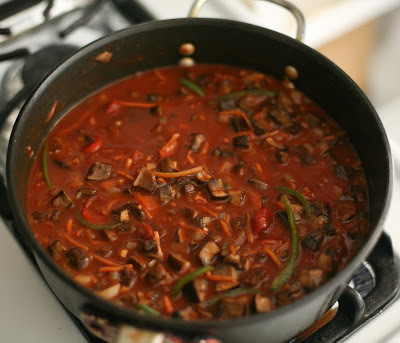 Mix agave, soy sauce, water, cornstarch, ginger and red pepper flakes in a medium sized bowl. 3. Continue to whisk until no corn starch lumps appear. 4. Pour sauce, along with the chick'n, in a medium sized skillet. 5. Cook under medium heat until sauce slightly thickens. 6. You may add more water if sauce is too thick. 7. Cover and simmer for 10 minutes. 8. Transfer to a serving plate and garnish with sesame seeds and green onions. It's been years since I last uploaded. Was wondering if anyone even followed me anymore and if I should bother sharing recent recipes. This dish is perfect for summer, whether it be for a little picnic outside or for a fancy get together dinner with your friends. 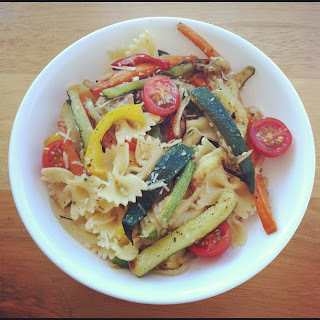 The colors from all the veggies are so bright and although this pasta maybe be a bit simple, it is loaded with flavor. 2. In a large heavy baking sheet, toss all the vegetables with the olive oil, salt, pepper and Italian herbs to coat. Transfer half of the vegetable mixture to another heavy baking sheet and arrange evenly. Bake until the carrots are tender and the vegetables begin to brown. Stir after the first ten minutes and allow it to bake for 20 minutes total. 3. Meanwhile, cook the pasta in a large pot of boiling salted water until al dente, about 8 minutes. Reserve 1 cup of the cooking liquid. 4. Toss the pasta with the vegetable mixture in a large bowl to combine. 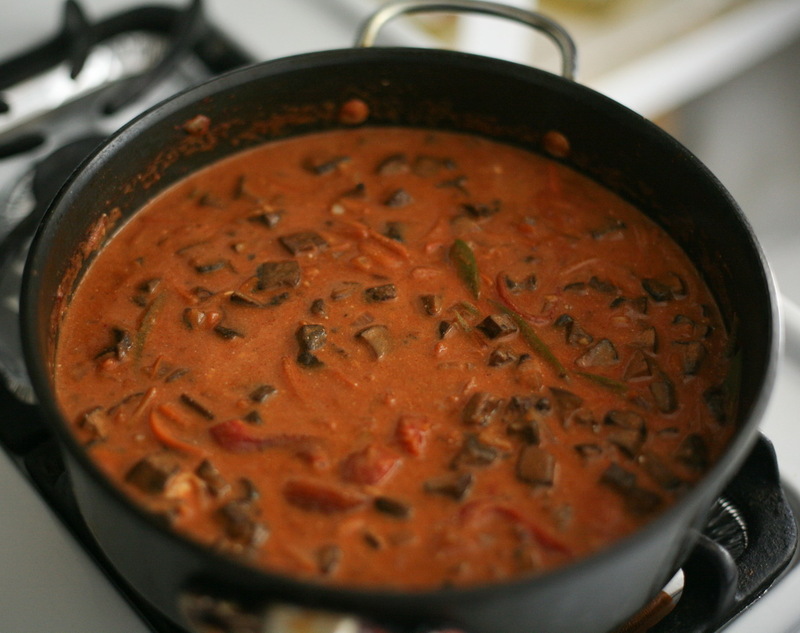 Toss with cherry tomatoes and enough reserved cooking liquid to moisten. Season with salt and pepper to taste. Sprinkle with vegan Parmesan and serve immediately. It's been so long since I've last blogged. I've been so busy and haven't really had time to update this. But I have a couple recipes I wanted to share with you guys. Hopefully I'll have them all up within the next few days. So basically, this recipe is from Veganomicon but I added vegan mayo and a couple other ingredients to make the pesto richer. I hope you enjoy! 1. Place the basil, cilantro, almonds, garlic, lemon juice and salt in a food processor and blend until pasty, scraping down the sides occasionally. 2. With the food processor on, slowly drizzle in the olive oil. Blend until relatively smooth and no large chunks of almonds are left. If you don't have a food processor and are using a blender, then just add the olive oil at the end, since many blenders aren't equipped with an opening to drizzle into. 1. Cook the fusilli and bow ties separately in a large pot of boiling salted water for 10 to 12 minutes until each pasta is al dente. Drain and toss into a bowl with the olive oil. Cool to room temperature. peas, pignoli, salt and pepper. Mix well, season to taste, and serve at room temperature. After having the past couple of weeks in the high 70s, the weather is finally starting to dip down and feel more like winter here in California. 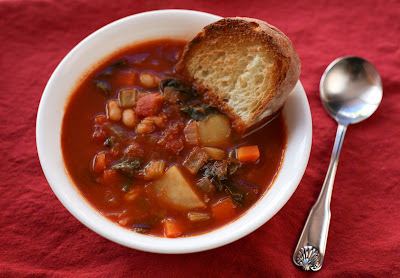 I chose to make minestrone soup for lunch today but with a slight twist. 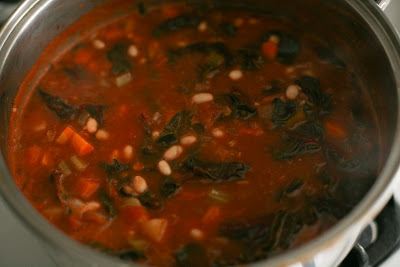 I added swiss chard and pureed cannellini beans, to help thicken the soup. 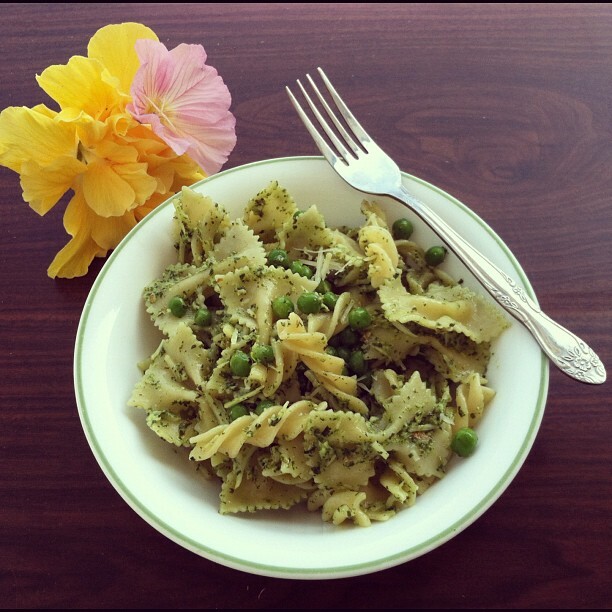 Serve this with a slice of bread and a light green salad to complete the meal. 1. Heat oil in a heavy large pot over medium heat. Add onion, carrot, celery and garlic. Saute until onion is translucent, about 10 minutes. 2. 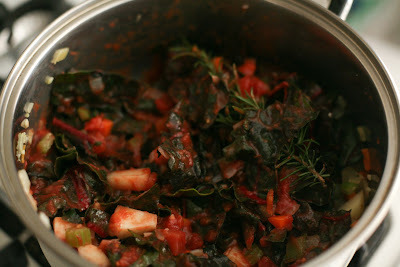 Add swiss chard and potatoes, saute for 2 minutes. 3. Add the tomatoes and rosemary sprig. 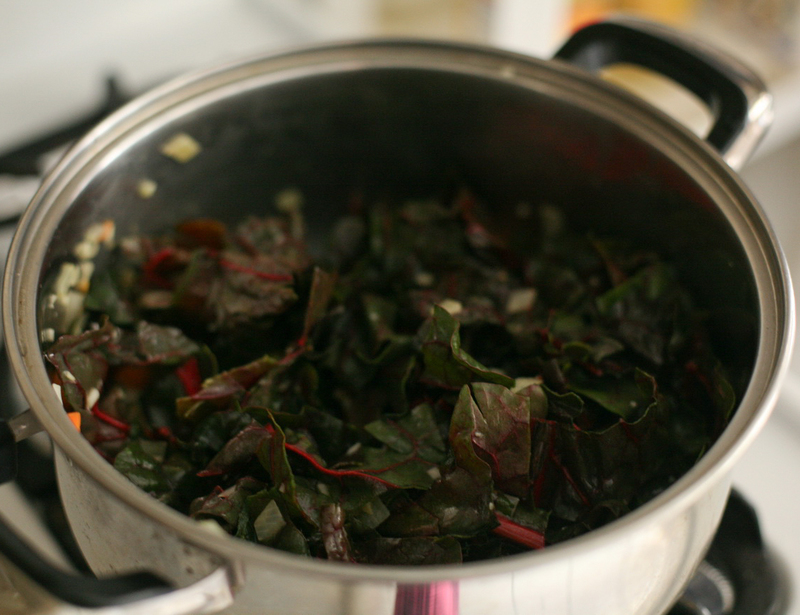 Simmer until the chard is wilted and the tomatoes break down, about 10 minutes. 4. Meanwhile, blend 3/4 of the beans with 1/4 cup of the broth in a processor until almost smooth. 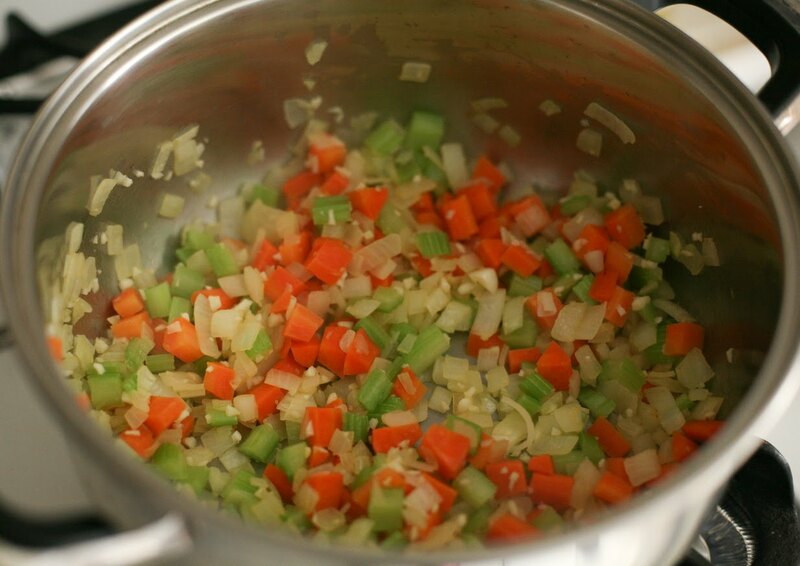 Add the pureed bean mixture and remaining broth to the vegetable mixture. Simmer until the potatoes are tender, stirring occasionally, about 15 minutes. 5. Stir in the whole beans. Simmer until the beans are heated through and the soup is thick, about 2 minutes. Season with salt and pepper to taste. ( Beware of adding too much salt because some stocks contains more than enough sodium ). 6. Discard the rosemary sprig, the leaves will have fallen off the stem. Ladle the soup into bowls and serve with a crusty piece of bread. I feel like it's been forever since I've done a blog post. Last year was just so crazy and I am finally finding the time again to get out my camera and share some vegan recipes. Anyone ever tried Paprikash before? It's one of Hungary's most famous stews and consists of some form of protein ( in this case, portobello mushrooms ), peppers, onions, paprika and sour cream. Traditionally this meal would be served over egg noodles but trying to keep it vegan and also healthy, any wide whole wheat pasta noodle will do. 1. 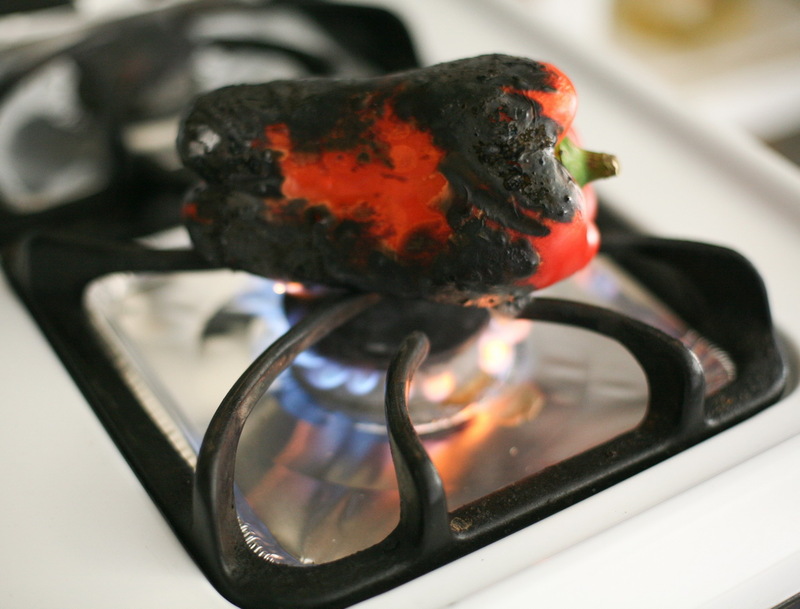 Char the bell pepper on the stove top or under the broiler with the oven door cracked for the steam to escape. Place the charred pepper in a plastic bag and allow it to cool. Scrape or peel the skin from the pepper, then seed and thinly slice. 2. Heat 1/4 cup of extra virgin olive oil in a large Dutch oven or large, deep skillet over medium high heat. 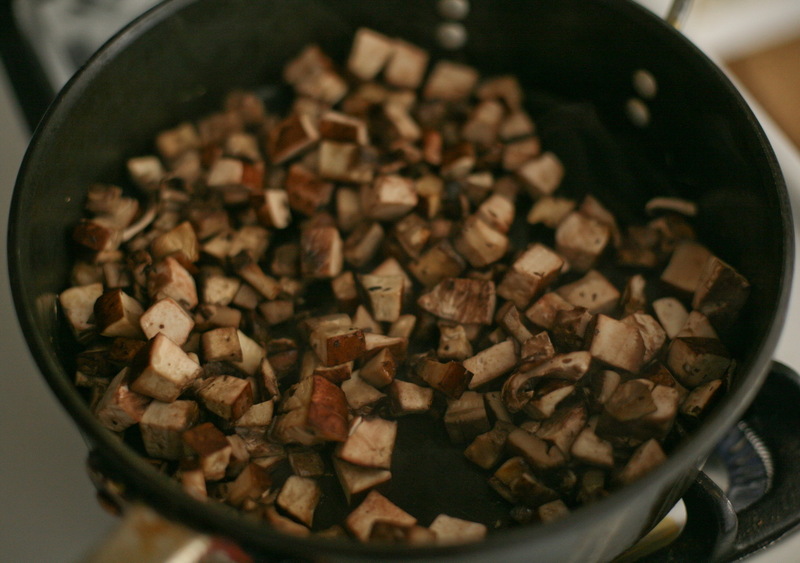 Add the mushrooms and brown 12 to 15 minutes until darkened and tender. 3. 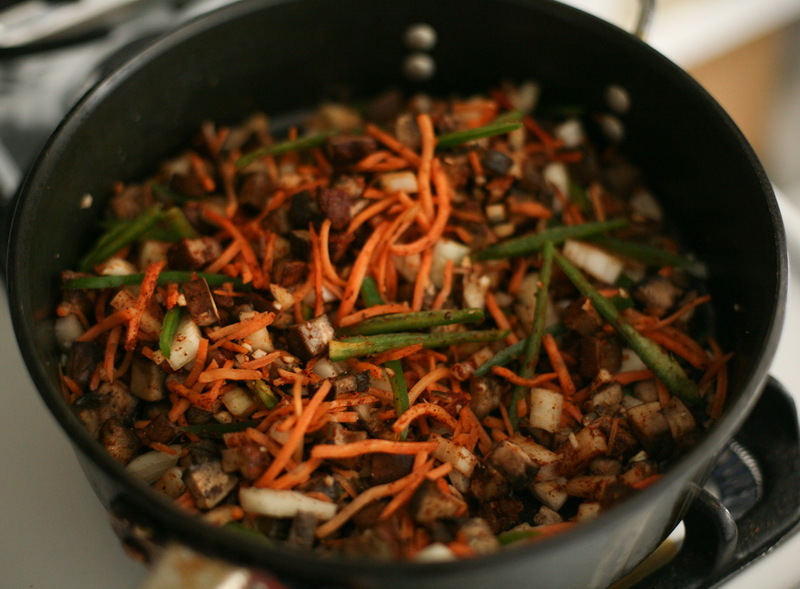 Add the jalapeno peppers, onion, carrot, garlic, paprika, salt and pepper, and cook to soften 10 minutes more. 4. 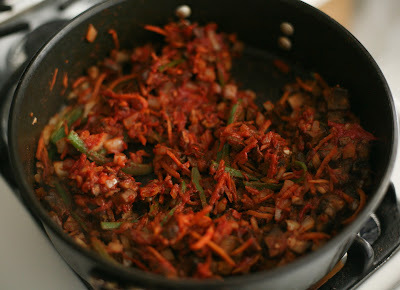 Add the tomato paste to the vegetables and stir for 1 minute. 5. Add the stock, worcestershire sauce and roasted red bell pepper. 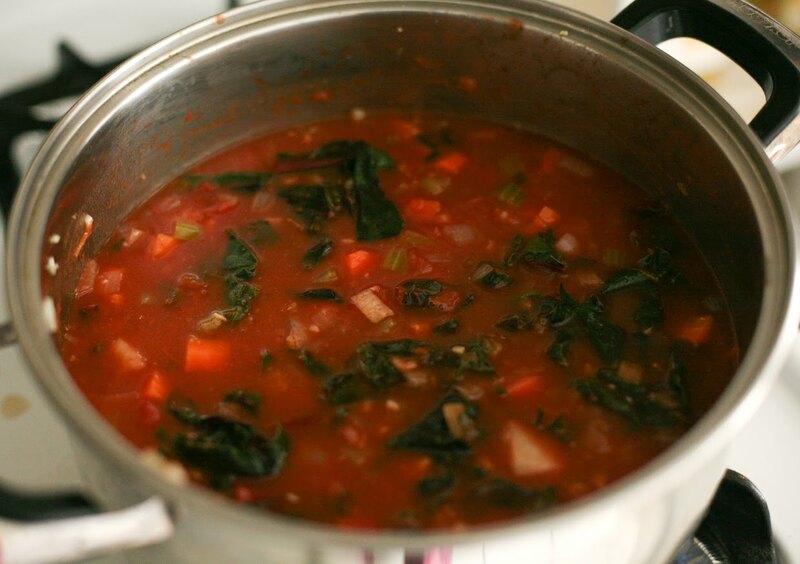 Simmer a few minutes for the flavors to combine. 6. Lower flame to medium low and add the sour cream. Mix well. 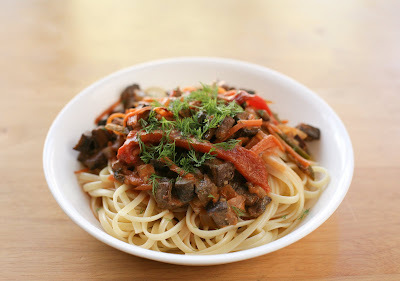 ***Serve Paprikash in shallow bowls on a bed of noodles.